With fall in the air, and that crisp chilly wind rattling my windows, I’m in full autumn mode. Yes winter feels just around the corner here in Chicago, but I’m still holding on to pumpkin-y fall flavors as long as possible. Two weeks ago was my street’s block party, and as has become tradition, I made 50+ donuts for all my neighbors. 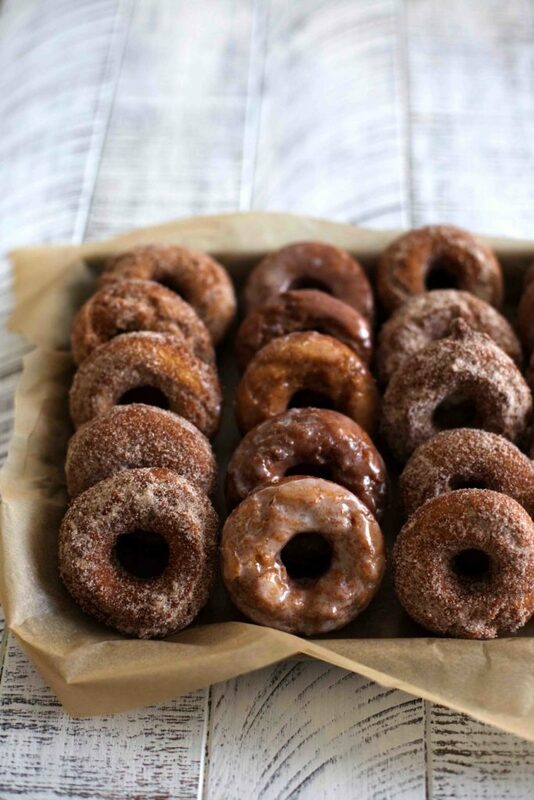 (Last year I made these Apple Cider Donuts!) The end result was just too good not to share with you, so here it is! These donuts are fried not baked, which in my opinion is what makes it a real donut. I just cant get behind baked donuts…aren’t they just cake?? For the first time, I used a deep fryer to make these and man oh man was it a game changer. 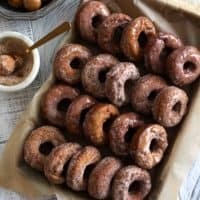 I have successfully made donuts just using a a pot of oil and a thermometer, but having all that guesswork taken out was really helpful. I borrowed a neighbor’s for this, but can see myself investing in one of these, even if it’s just for making donuts a couple times a year! 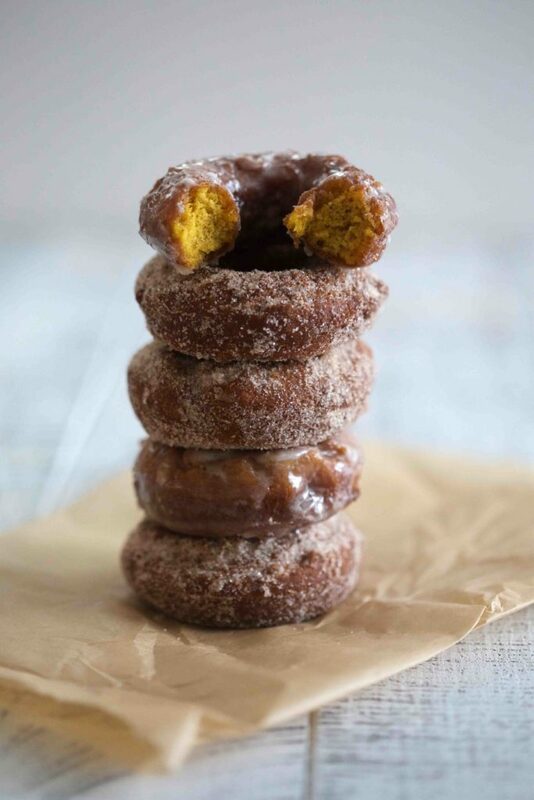 The donuts themselves are full of sugar and spice, with lots of pumpkin to yield a perfect texture. 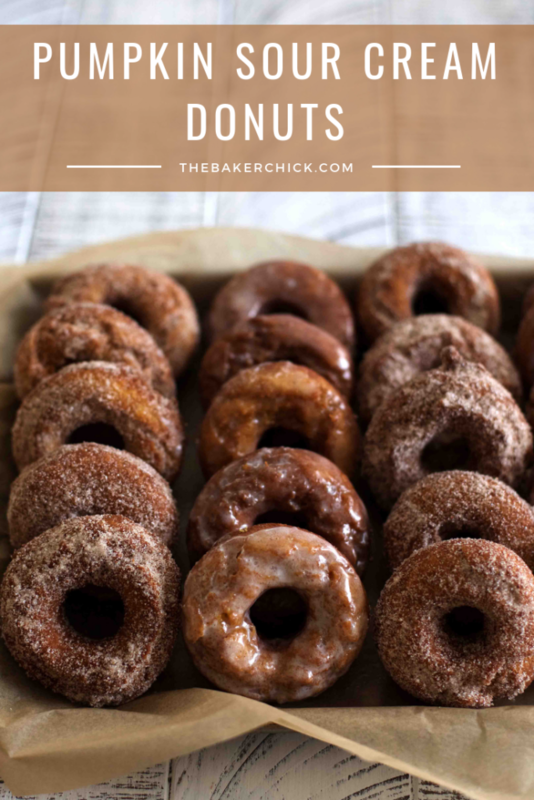 They are coated in two different toppings: A spiced sugar with cinnamon and nutmeg, and a glossy maple glaze. Both varieties were devoured so quickly, it’s hard to decide which was more popular. I loved them both so much! It’s important to note that a deep fryer isn’t needed for this recipe. I’ve made donuts several times on my stovetop with a thermometer to gage temperature and it’s been fine. The deep fryer took out the need to adjust the heat throughout, but you can totally do it! Mix up the ingredients for the spiced sugar, set aside. For the glaze, mix the powdered sugar and maple syrup together with a fork, and then add the heavy cream or milk in, a teaspoon at a time, until the glaze is smooth and at your desired thickness. In a large mixing bowl, use an electric mixer and combine the brown sugar and butter, creaming until well combined. Add the egg and yolks, one at a time, and mix until smooth. Add the vanilla, sour cream and pumpkin, folding in until well incorporated. Mix the dry ingredients in on low speed until just combined. Don't overmix! Cover the batter and chill in the fridge for 3 hours or more, or you can speed this up in the freezer for about an hour, stirring the dough a little bit halfway though. When dough is ready, roll it out on a well-floured surface to about 3/4 inches thick. Use a donut cutter, or a biscuit cutter with a pastry tip to cut your donuts out. (I find it helpful to flour the cutters between cuts to help the donut release easily. Heat oil to between 365F and 375F. Test one donut first, frying for one minute, flipping and then one minute more. Check to see if this is your desired texture, and then adjust your timing as needed. I found that depending on how thick I cut them, I needed between 45 seconds and 1 minute per side. 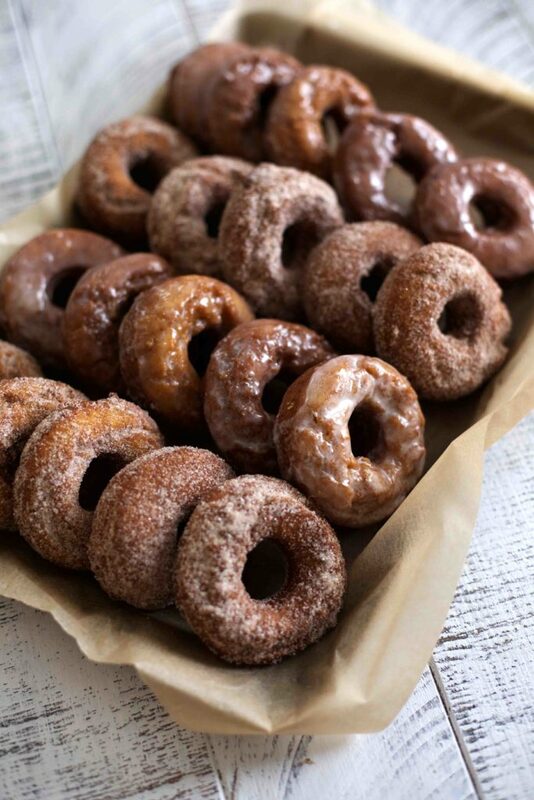 Place freshly fried donuts on a paper-towel lined plate. 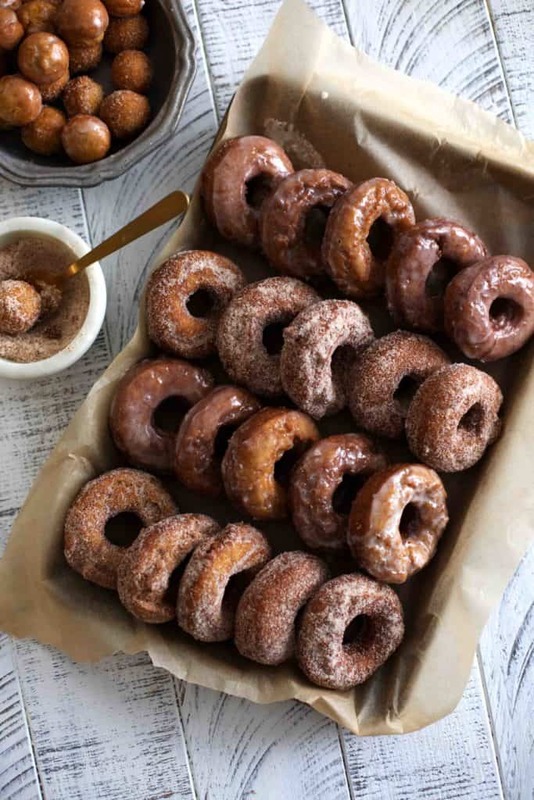 Toss half the donuts in the sugar, and dip the other half in the glaze. Enjoy! Now you’re making me think I need a deep fryer…it would be so perfect for frying tofu, falafel…and of course DONUTS. These look amazing! I’m so impressed that you made FIFTY. I made these yesterday and oh my goodness they are good! Not only are they delicious the day I made them, the next day they are equally as good. I also have to thank you for detailed directions, they are easy to make. Thanks so much I have a feeling they will be a family favorite! These donuts are amazing! First time making them and love them. The dough was easy to work with. Perfect amount of flavor. This recipe is definitely a keeper. Yay! Thank you so much! I love them too!